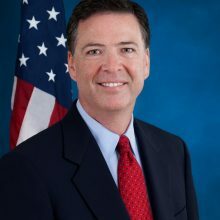 The Intelligence and National Security Alliance will host a leadership dinner March 29 featuring FBI Director James Comey at the Hilton Mark Center in Alexandria, Virginia. Comey will speak to the strategic importance of the FBI’s role within the intelligence community and his vision for the bureau in 2017 and beyond. Following dinner, Comey will participate in a moderated discussion on his key priorities and challenges at the FBI, as well as take questions from the audience.